It’s now standard practice to release a game at retail and digitally at the same time, but that wasn’t the case in 2007. Warhawk was a trendsetter, but it was a bumpy road. Warhawk was supposed to be one of PlayStation 3's biggest early exclusives, an ambitious resurrection of a cult classic for the original PlayStation. But a troubled development forced some big changes, including making the game multiplayer-only and becoming the biggest console game to be released simultaneously at digital and retail. The original Warhawk, released back in 1995, was goofy as hell. Though it was one of my favorite PlayStation games—it gave me a Star Fox vibe—it was mostly known for awkward yet charming full motion video cut scenes. It always bummed me out that Warhawk never got a sequel, but it makes sense; the game’s developer, SingleTrac, was also behind Jet Moto and Twisted Metal, which both blew up. There wasn’t enough room for it. That game never happened. 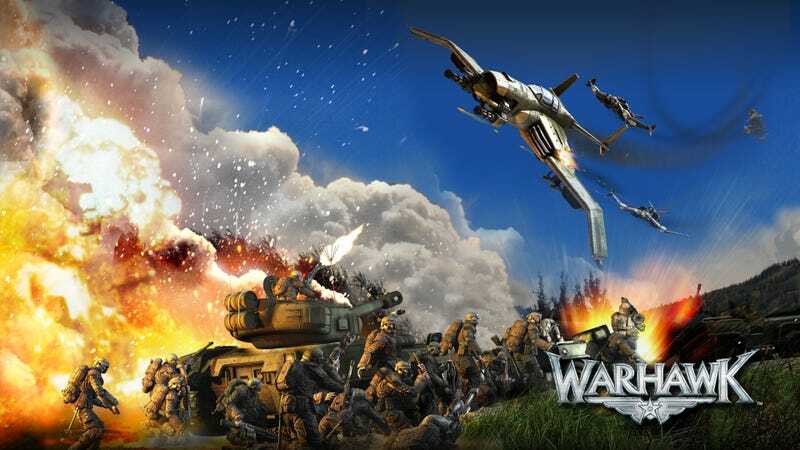 Sony delayed Warhawk several times, as rumors of a troubled development continued to spread. Developers were leaving the project, rumors suggested it might be cancelled. The decision was made to axe the single player campaign entirely and focus on multiplayer. Even the recent Titanfall caused waves when it was revealed the game wouldn’t have single player—this was an even bigger deal back then. Vague statements continued for weeks and months. Phil Harrison made a WarHawk-related announcement at GDC which was something of a bombshell: WarHawk, one of the first games to make sensible use of the six-axis controller’s motion-sensing capabilities will be available only as a download over the PlayStation Network – it won’t appear on Blu-ray Disk – with a multiplayer-only focus. Nevertheless, we shouldn’t have to wait too long for it after launch – Sony says it will arrive this autumn, and it could come as early as July, according to developer Incognito. Pricing hasn’t yet been set, but it’s likely that it won’t cost as much as a full-priced, boxed game. Soon after, Sony completely walked back that statement. It was a mess, but the dust eventually settled: Warhawk would come out on the same day digitally and retail—August 28. This was big. Previously, as Jobe pointed out, downloadable releases were limited to games like Geometry Wars or full-priced games after most of the sales happened at retail. Though Warhawk’s gameplay might not have left much of an impact, its release was a significant event in the history of buying video games. There was all sorts of other controversy associated with its release, too. Even after the digital release was confirmed, Sony refused to say how much the game would cost. Since there wasn’t a single player mode, Sony announced they didn’t intend to charge full price, but what did that mean? “We will be pricing it to match what we are delivering in terms of graphics, gameplay, fun-factor and repeat playability, which we think is quite high,” the company said to 1up at the time. At retail, Warhawk was going to cost $60; it came with a $40 Bluetooth headset. That suggested $20 for digital, but that’s a huge disparity in cost. The game ended up being digitally priced at $40. Though Warhawk would not spawn its own sequel, a spin-off called Starhawk came out in 2012. That one did have a single player mode.